Upper epidermis - Contains no chloroplasts and is transparent to allow light to penetrate into the leaf. 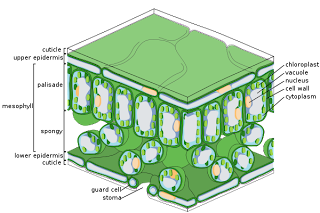 Palisade mesophyll – packed tightly together near the top of the leaf to collect as much sunlight as possible. They contain many chloroplasts and most photosynthesis takes place in these cells. The spongy mesophyll - contain air spaces to allow the movement of gases (i.e. carbon dioxide and oxygen) throughout the leaf. Guard cells – helps regulate the movement of gases into and out of the leaf. They also help to control the loss of water vapour (transpiration). Leaf is thin to reduce the diffusion pathway and to increase the rate of diffusion. Air spaces increase the surface area to volume ratio of the leaf, therefore the rate of diffusion of O2 and CO2 (also reduces diffusion pathway as allows gasses to move through leaf).